We're honored to feature "The Herculean Wrestler" by Michael Chin in Issue One of Orson's Review. We're also very fortunate for the time Michael took to sit down and chat with us about his journey as a photographer. 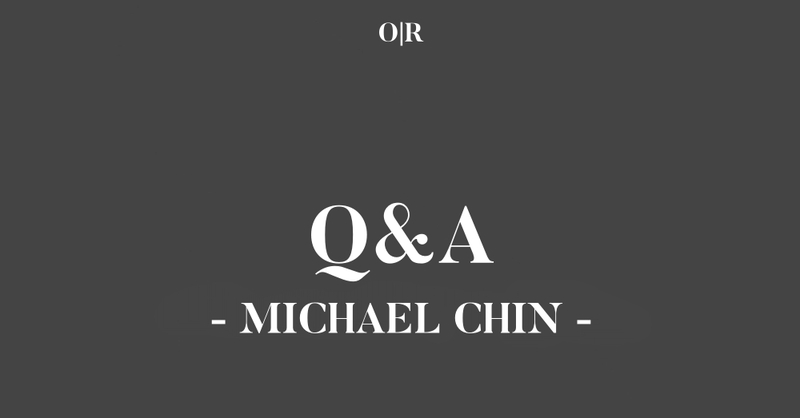 *The following interview involves Orson's Publishing (OP) and Michael Chin (MC). MC: As a kid, as soon as I learned to read, I immediately wanted to write my own stories. I like to think my efforts grew more sophisticated over the years, but that kernel of wanting to create carried through. I still consider myself a fiction writer first and foremost, but I've dabbled with poetry off and on for decades now. I'd all but given up on it until I took a class on hybrid forms during my MFA program at Oregon State just a few years back, which really opened my eyes to what poetry could be, and resolved once and for all that poetry didn't need to take one specific shape. Once I started thinking of poetry as less separate from prose, and more of a way of isolating and exploding a particular moment or image, I started to fall in love with it all over again. MC: I wear a lot of hats--teaching writing at the collegiate level, doing some freelance writing and editing work, and tutoring online. I love to write more creatively and try to carve out at least a few hours each week for it, but I haven't found a sustainable way for it to pay the bills just yet. OP: What about "The Herculean Wrestler" are you most proud? MC: "The Herculean Wrestler" was one in a series of prose poems I wrote about various professional wrestling archetypes last spring. A big part of this one was capturing the ethos of late eighties/early nineties wrestling star Rick Rude. He's best remembered by fans for his sleazy lady's man gimmick, but other wrestlers often cite his philosophies and personal attributes, including that he was incredibly strong, and that he always advised his colleagues that wrestling was an upper body business so the smart time in the gym was spent working on your upper body. I like to think this poem successfully captures some of that psychology, and the difference between a pro wrestler, particularly in his era, and a "real" or "shoot" wrestler. MC: My approach varies quite a bit from project to project but, particularly for poetry, I've found myself working in clusters around a common theme or zeroing in on small pieces of the same story. The past couple years, that included a series of really personal memoir-style poems, a meditation on pregnancy through witchcraft when my wife and I were expecting our son, a cycle remembering my grandmother, and a big collection of prose poems that mixed fact and fiction recalling 1990s NBA happenings through the lens of a sports-obsessed divorcee making a pilgrimage to the Basketball Hall of Fame. "The Herculean Wrestler" was from the second series I've written centered on pro wrestling, and I wrote most of those poems in a time when I was traveling a lot for work and could only work in unpredictable and short snippets of time. My aim was to churn out a poem in a fifteen minute sitting, then worry about spending much longer chunks of time revising and shaping the work later on. MC: My ambitions bounced around a good bit, but creative writing was the common thread, whether it was as a primary vocation, or something I'd do on the side while I was practicing law, working as a newspaper reporter, or whatnot. I don't think I ever committed to another aspiration fully enough for it to really have big impact on my life and in the end, I think that getting the reps of writing a lot when I was a kid and teenager--even though the work was, looking back, by and large terrible--set me up for an adult life in which the act of writing was part of the fabric of how I live. MC: I guess that a part of why I'm so attached to this writing life is that not much of my pursuit of it has really felt like a sacrifice. Sure, I've spent a lot of time hunched in front of a notebook or laptop when I could be doing something more social or relaxing, but I honestly don't know that I'd in any meaningful way rather be doing those things than putting words on the page. Of course, I'm starting a new balancing act in life now. My son has been with us for less than two months at the time I'm answering this question, and I always said that I didn't want to have children until I was ready to make them the number one priority in my life. As anyone who has been a parent would guess, I've already sacrificed writing time for him and expect that to be the new norm; I expect that the inverse--sacrificing family time for writing--will inevitably come up, and I expect that will be the biggest sacrifice. MC: This number has varied a lot over time. There came a point, a couple years out of my undergrad, when I realized I wasn't reading much at all and if I were serious about pursuing my ambitions as a writer, I needed to make the time for it. I took on a rough regimen of reading at least one literary book, and one non-literary book per month--the former to further my craft and celebrate the great work writers are doing in the world, the latter as a way of waking up in the morning and indulging my guilty pleasures like pro wrestler memoirs, YA books, or more pop literature. When I left full-time employment to pursue my MFA, my reading numbers went way up as I was reading for classes while still trying to maintain a personal reading regimen, too. Fatherhood is the new frontier--I don't know that I've ever read less than I did in the first month of my son's life, and I'm eager to re-negotiate reading into my life as things settle. MC: I have attended a number over the years. One that springs to mind was a reading by Kazim Ali. First and foremost, he's an incredibly talented poet, but I was most captivated by his discussion of language and approach to craft. In particular, he discussed wanting to write a poem with words so unique to American English that they defied translation (I'm butchering the explanation, but that's the general idea). For example "empties" in the sense of empty bottles at a bar, doesn't really have an equivalent one-word translation in other languages, and thus is a unique sentiment to capture in our vernacular. While I tend to gravitate more toward readings by prose writers, I think it's this kind of attention to detail and individual words that makes real deal poets so enthralling to me. MC: Mutual respect and support is so important. If there's one thing I could go back to tell my younger self--in my teens and twenties in particular--it's the idea that writing shouldn't be a competitive endeavor. Very rarely are two writers really trying to do the same thing, so there's more than enough room for everyone at the table, and for everyone to celebrate each other's successes. I've had the good fortune of being involved in multiple different excellent literary communities over the years, and it's this sense of different people pursuing this passion together, and furthering one another's craft not out of competition but collaboration that feels most important to me. MC: The short answer is no. Absolutely not. I know plenty of excellent writers who didn't go the MFA route, and I don't think that having done an MFA made me more of a "legitimate" writer, whatever that might mean. On the other hand, for my personal experience, pursuing an MFA was an enormously positive and transformative time in my life. Being immersed in literature, constantly talking about craft, and having the time to write around people I liked and respected all helped push my writing in crucial ways. So, the more complex answer: I don't think an MFA is for everyone, or that it is essential. For those who do have the privilege of resources and time to be able to justify going for one, I do feel it has the potential further a writer's career and craft in unimaginable ways. MC: For years, poetry really intimidated me because I hadn't formally studied it at length, and I didn't think I really got it. My read is that poetry has grown increasingly hybrid and inclusive over time and I hope that that momentum continues. In my ideal vision, poetry can mean a lot of different things and operate with fewer restrictions, more opportunities. I'd also love a world in which poets aren't the only ones engaged in contemporary poetry. While I can't claim to have a mission statement as a poet, I do feel that's an intrinsic piece of the poetry I pursue, writing about things like pro wrestlers and basketball memories that are perceived as relatively "low brow;" I hope the subject matter might invite more hesitant readers into the conversation. MC: I'm operating from a position of having far more ideas, notes, snippets, and outlines than I'll have time to earnestly execute anytime soon. I think that's a good space to come from. I don't know where the journey is going, but I'm quite certain there is a road ahead. Be sure to check out "The Herculean Wrestler" by Michael Chin in Issue One of Orson's Review.